It’s probably the most complicated knitting project I’ve tried yet! But it was tons of fun, and the pattern actually leaves a lot of room for customization and altering stitch patterns. 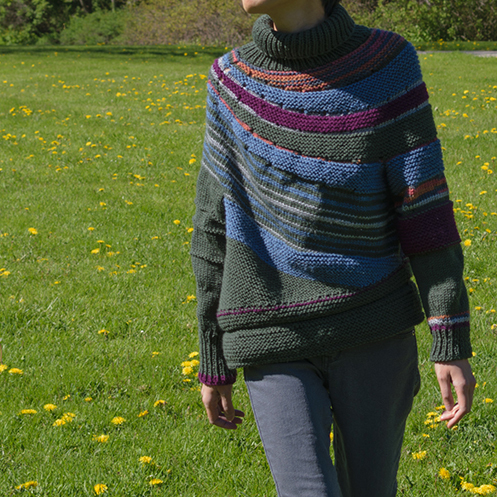 Like the garter stitch ridges I have on one sleeve, and the couple of rows of stockinette at the bottom of the sweater. Indeed! 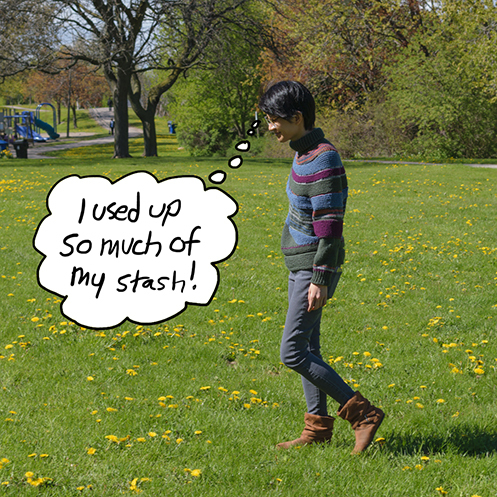 It used up a lot of my very old stash. I actually inherited scraps of the variegating orange, purple and blue from my mom, who probably bought the yarn in the late 90s. 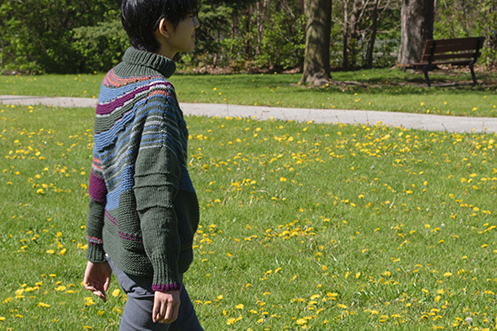 I’ve never read Ursula Le Guin’s Earthsea series, only saw the animated adaptation by Studio Ghibli, but thought it’s a fitting name for the sweater with its shape and colours. I’d like to read the books one day. Superbe et , sans flatterie, beaucoup plus joli que le modèle! Les couleurs sont magnifiques. Bravo!! thanks so much Claudine! It was a fun make! just came across your sweater called earth sea. It looks great! would love to try knitting it Can yo tell me where to get the pattern in a size 34 inch bust? and approx. how much wool I would need in the different colours? Can’t tell you how much yarn I used for each colour though… sorry that I can’t be more helpful on that, it’s all stash yarn so I didn’t keep track. I know that for the main green colour I used a giant ball of Red Heart that was over 1000 yards, and I hardly used half of it. Hope you have fun with the project!